Paint Along Studios, take the stress out of planning. We guide your party from beginning to end. 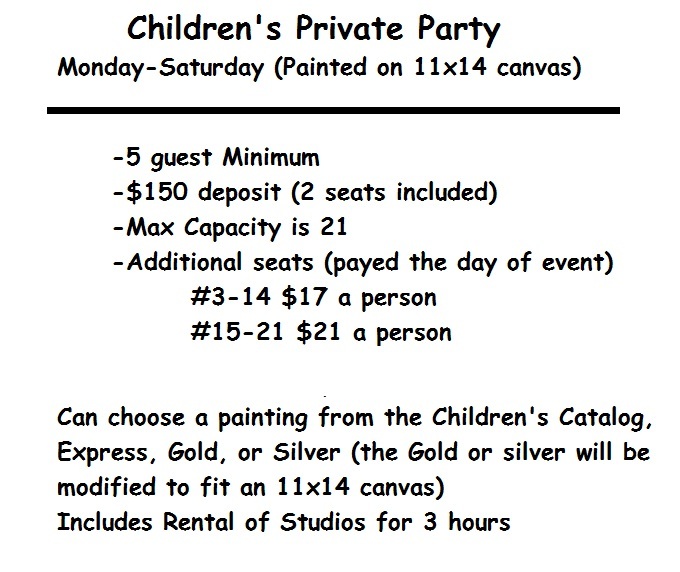 The following pricing point is applicable for children of all ages up to 16 years old. The deposit is $150, There is a 5 person minimum. The deposit would need to be paid to officially reserve your event-additional painters can pay online or the day of the event, if you desire. We have room for 21 painters. As part of your private party you can choose to create a 3 hour music playlist. We have access to a 35 million song catalog through our music subscription. You can give us a list of song and artist and we will gladly get the playlist together for your. Otherwise a house playlist will be selected during the event. A full 3 hour “Children’s Party” schedule is usually as follows: Paint for 1 hour, take a 15-20min break for snacks and drinks if they are brought, finish the painting, as the painting dries you may have cake or more snacks, open presents, have announcements, take group pictures, etc. There is almost always extra time available during a “Children’s Party”, this allows us to either wait for late party guests or get them caught up during the breaks, allows for snacks and breaks, etc.